It's normal to grab a cup of coffee before the day starts, or read the papers (yes there are still some of us that prefer reading actual newspaper instead of reading things online). Or maybe for some people, a pack of cigarettes a day is their norm. It doesn't seem like too much money if you see it on a day by day basis. But if you compile it into a yearly price, it can actually be pretty pricy. So I decided to do a little bit of research to see how much these daily things can cost. Below are the details of how I calculated these numbers. Obviously a lot of them are just average. The numbers are mostly according to US average costs, but it can still vary a lot depending on which state you're in, or what kind of expensive phone plan you use. Also I've compared the newspaper and phone bill costs with Hong Kong and Taiwan. 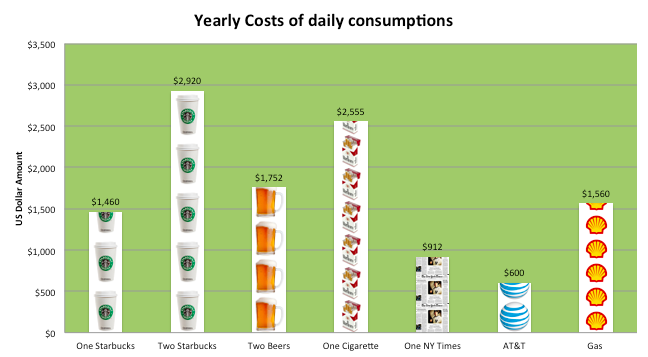 Never knew Starbucks coffee could add up so much! This is exactly why Asian parents go nuts about the littles of change or pennies. In Chinese we say "積少成多" save up many little things and it'll add up to a lot. So next time before you buy that extra cup of coffee, or smoke another pack of cigarettes, think about that holiday destination you've always wanted to go to! Because a year worth of these things can buy you more than a round trip ticket across the world.